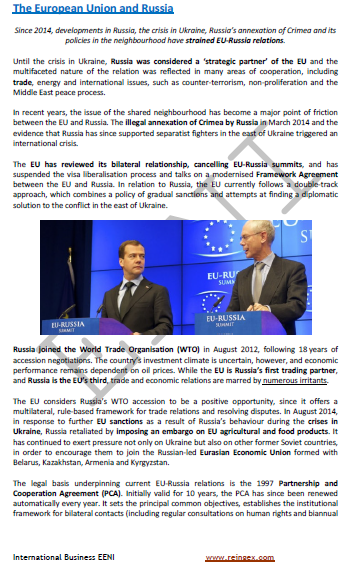 Syllabus of the Online Course (Subject): European Union-Russia Trade Agreement. Description of the Online Course: European Union-Russia. The Russian Federation is the third largest trading partner of the European Union, with the Russian petrol and gas exports making up a significant percentage of Russian exports to Europe. The European Union and Russia finished a Partnership and Cooperation Agreement in 1994. Negotiations on a New European Union-Russia Trade Agreement were initiated in 2008. The New Agreement European Union-Russia provide an exhaustive framework for the European Union-Russia International Trade Relations (new dispositions on bilateral trade, foreign direct investment, and energy). Russia belongs to the Economic Area of Orthodox Civilisation and the countries of the European Union to the European area of Western Christian Civilisation.